Frank Cifaldi runs the videogame history foundation and develops videogames. 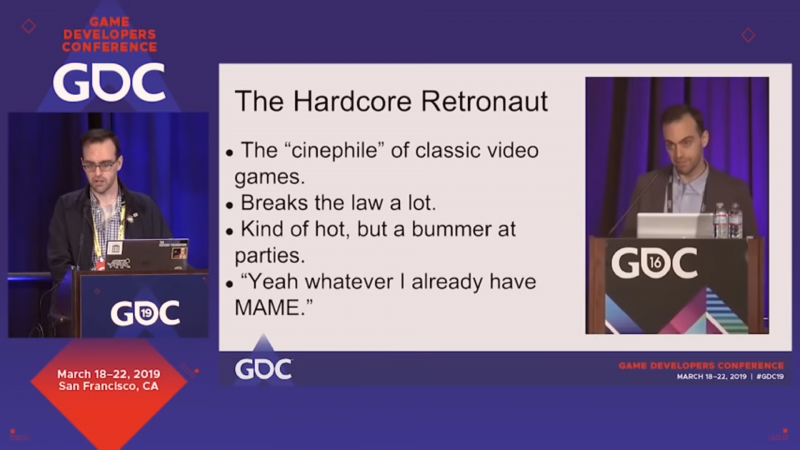 He mentions ideas like modernising old games by modifying the program e.g. graphics, merging features, adjusting gameplay. Edited by mr_me, Fri Apr 12, 2019 1:28 PM. Very nice. Something for me to play in the background this Friday afternoon. edit: something that strikes me as I watch the first few minutes (where he recaps his previous talk) is how unlike the movie industry the games industry is. Movies have been very platform-independent for years. A studio makes a movie and then makes it available on whatever media is out there. By contrast, 1st-party games in particular have this problem where the movie studio owns the theater/physical distributor/whatever. Nintendo owns the movie so it only puts it in its theaters. Sega owns its own movies and makes them available on lots of formats. Sega's DVDs play on most (but not all) players, but Nintendo's movies only work on its theater systems. And yes, I'm using the "movie" metaphor intentionally. It's absurd to think of a movie being unavailable because it only works in some theaters, but that's exactly how software works. Edited by derFunkenstein, Fri Apr 12, 2019 1:48 PM. Edited by Newsdee, Sat Apr 13, 2019 5:38 AM. Thanks for sharing. I'll watch it later this weekend, too. I think I've heard most of his points in his preservation talk but I'll bet he's sharpened it up, and I'm glad these points are out there.